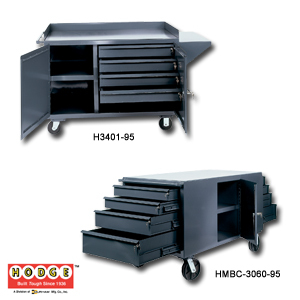 A complete tool storage center on wheels. Easy glide drawers are full suspension with 250 lb. capacity each. Provides high-density storage capacity plus convenient mobility. Includes convenient top work and storage surface. Made of heavy-duty, 14 ga. steel all-welded construction. Drawers are 24-7/8"W. x 19-5/16"D. Each drawer includes cylinder lock and 2 keys, keyed alike. Rolls on bolt on 6" x 2" phenolic casters, 2 swivel, 2 rigid. Finished in durable Gray powder/paint. Shipped fully assembled and ready for work. FOB Shipping Point. Space Wt. (lbs.) Price Ea. HMBC-3060-95 4000	 60 x 30 x 34"	 2-4", 1-6", 1-8"	 4-4"
H3402-95 2000	 60 x 24 x 38"	 4-4", 1-6"	 4-4"